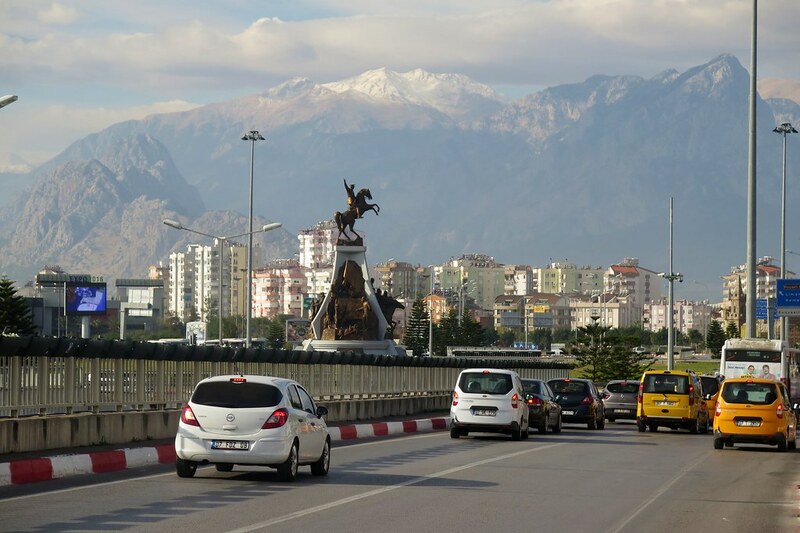 From Alanya, the next stop was another big tourist city beginning with an ‘A’, Antalya. 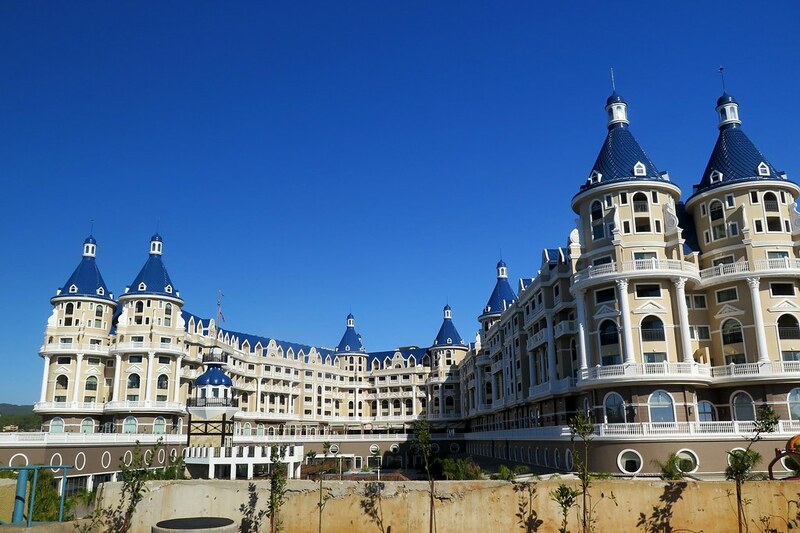 Between the two, there wasn’t too much of interest, other than the motorway, lined with big empty hotels and private beaches. A lot of them were on our right, so seperated from the beach by 6 lanes of traffic. 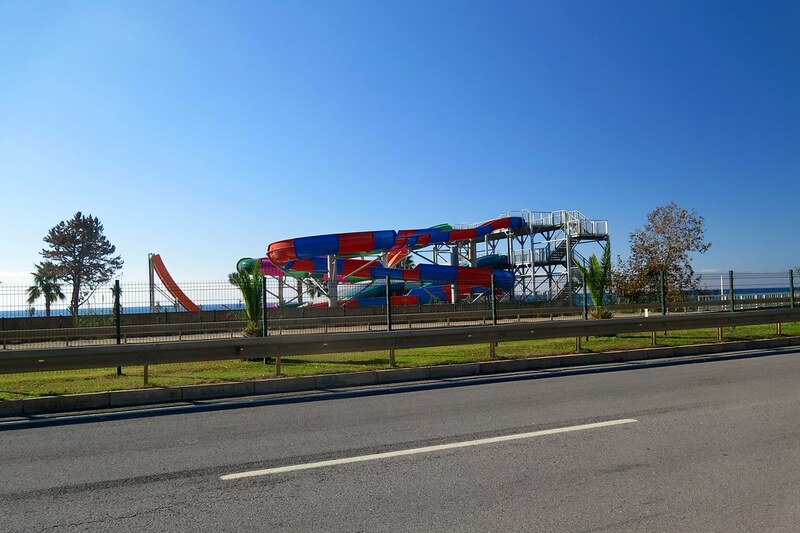 On the beach side of the road, there were water slides. Hundreds and hundreds of waterslides. 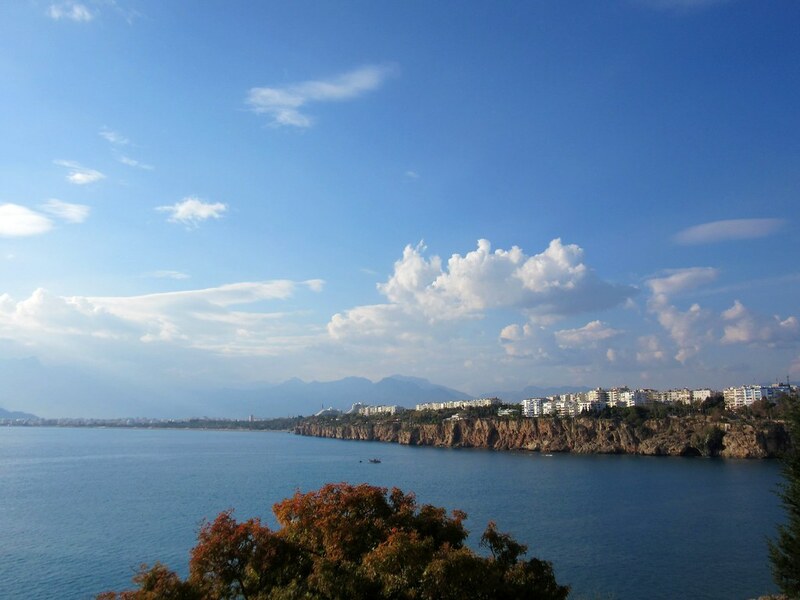 So, we got to Antalya as quickly as we could. Again, once we got into the centre, the city had a good feel to it. There’s a lovely old town area which hugs the cliffs next to the sea, so we had another couple of days off wandering round. A couple of real finds on the food side, amazing Turkish ice creams on waffles, and a restaurant serving all different kinds of fish and seafood sandwiches, fried to order. 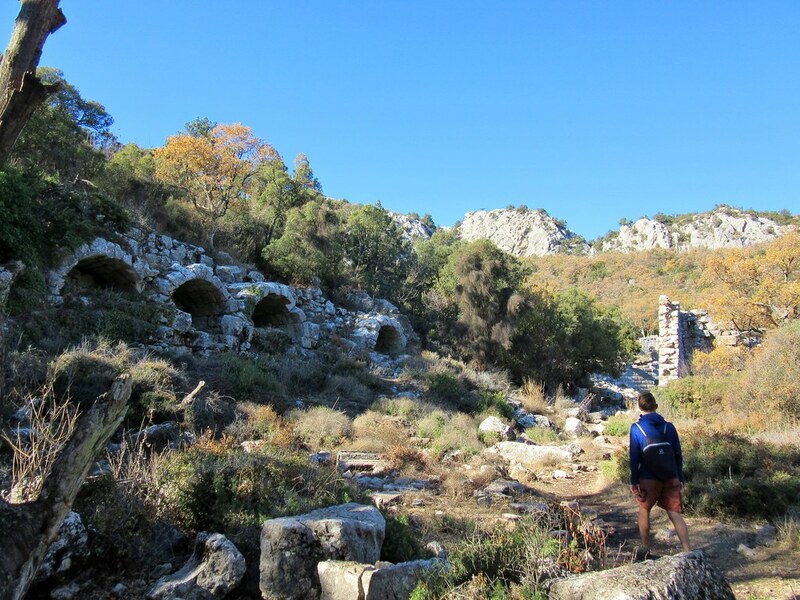 We’ve been seeing more and more old ruins and signs to Unesco sites as we’ve been cycling and we decided we ought at least to see one of them. 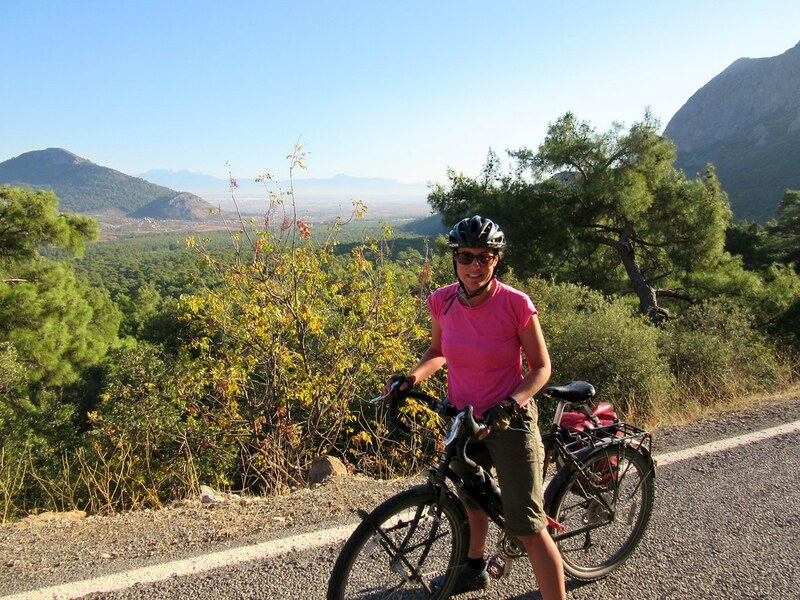 Close to Antalya is the old city of Termessos, so on one of our rest days, we decided to cycle out to see it. 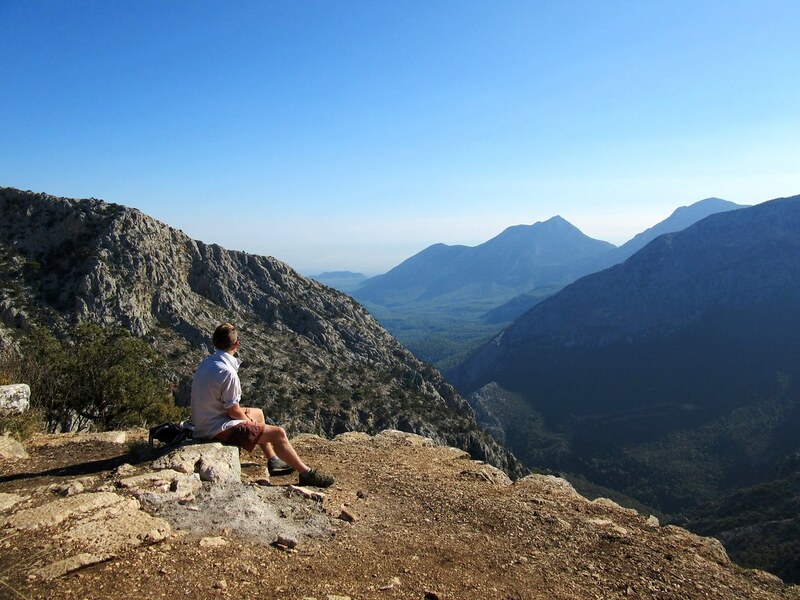 I say ‘close’ to Antalya, but actually it’s 35km away, and 1,000 metres up in the mountains. Once we turned off the main road and started the climb up the access road, we were very glad to have left our panniers back in our accomodation. Without the extra weight, it was actually a beautiful ride, especially as we weren’t passed by a single car on the way up. The carpark was empty when we arrived, we were the only people there. It was a short hike up through the woods from the carpark on to a ridge, which was amazing in itself. At the top, we started to see big stone ruins that have just been left as they were found, slowly being taken back by nature. It was awesome to have free access to the place and be able to climb around and explore. 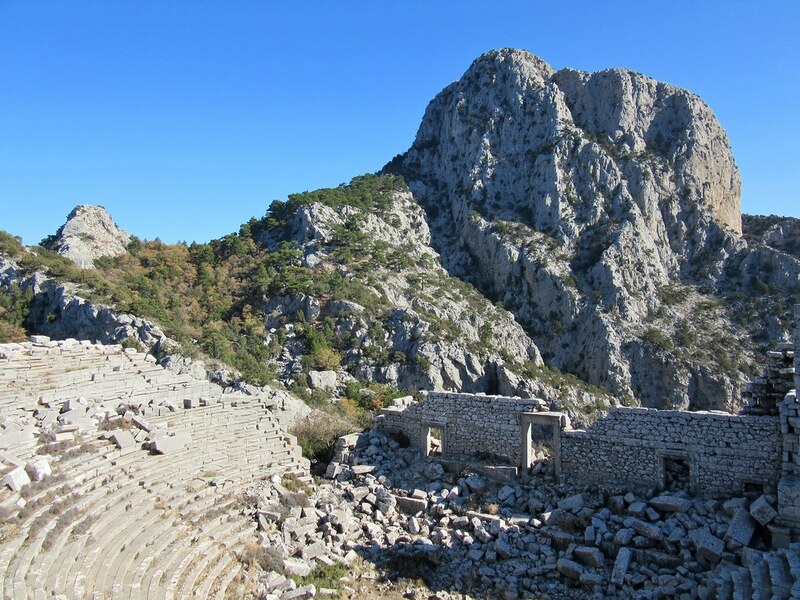 The highlight was the old amphitheatre, perched up on the edge of a big cliff, with views back down to Antalya and the sea beyond. Normally we’re not particularly into the museums or cultural sites, but this was great, more like a hike with extra old stuff, and we really enjoyed ourself. 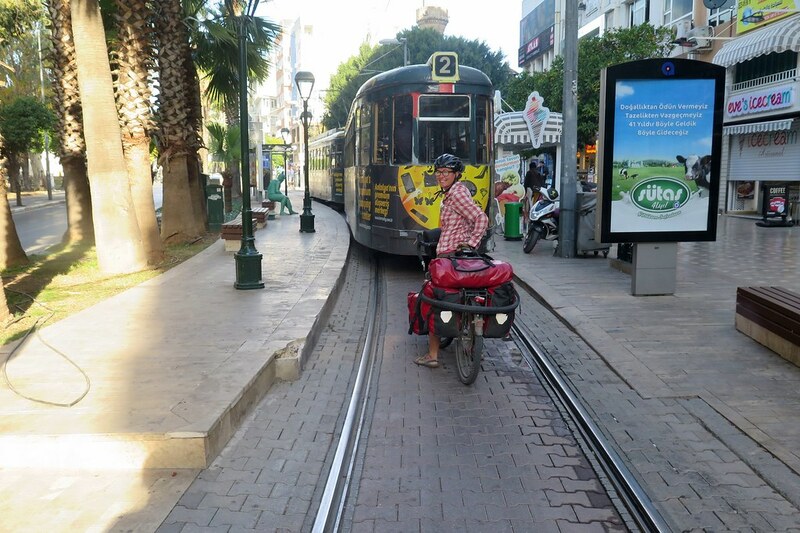 Leaving Antalya the next day, we followed the cycle lanes, which are pretty sketchy as they are basically the tram lines. You have to keep your eyes open for trams in both directions, and be careful not to drop a wheel into the tracks. Soon we were out of the centre and riding west, facing mountains with a dusting of snow up high. We had a choice here of following the shorter, more direct road inland or taking the longer route around the mountains following the coast. It wasn’t a difficult decision, we both wanted to take the coast road, as we’ve been loving cycling next to the sea. 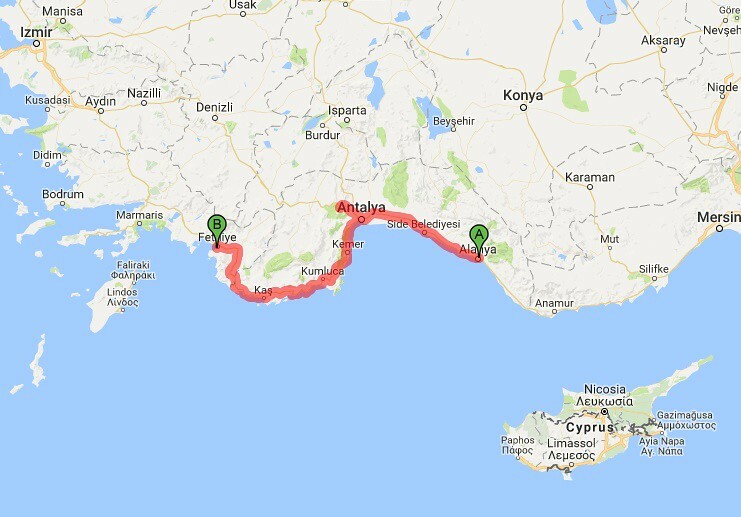 With a very leisurely couple of weeks ahead until we take the ferry to Greece before Christmas, we’re only looking at about 50km per day. We were looking forward to chilled days and lots of time relaxing on the beach. Soon after we left the city and big hotels behind, we turned off the main road down a dirt track to a bay that I’d seen on Google Earth. We went through a pine forest and came out in a clearing that led through to a stony beach. There were a few fishermen on the beach and a couple of old caravans among the trees, it looked like it’s a campsite during the summer season. Perfect place for us to camp, there was even a water pump. During the night, headlights shone on the tent, and we heard a car getting closer. It stopped next to the tent, the blue lights came on and they beeped their horn (as if they needed to get our attention). Maybe it wasn’t the ideal camp spot after all. I poked my head out the tent and saw a Jandarma (military police) van. The two guys in the van spoke to me in Turkish, but I understood passport. Once I got out and showed them my passport they were pretty friendly, looking through at the different stamps. They said we were fine to camp there, and let us get back to sleep. We had a lazy start the next day, a 2 coffee morning. 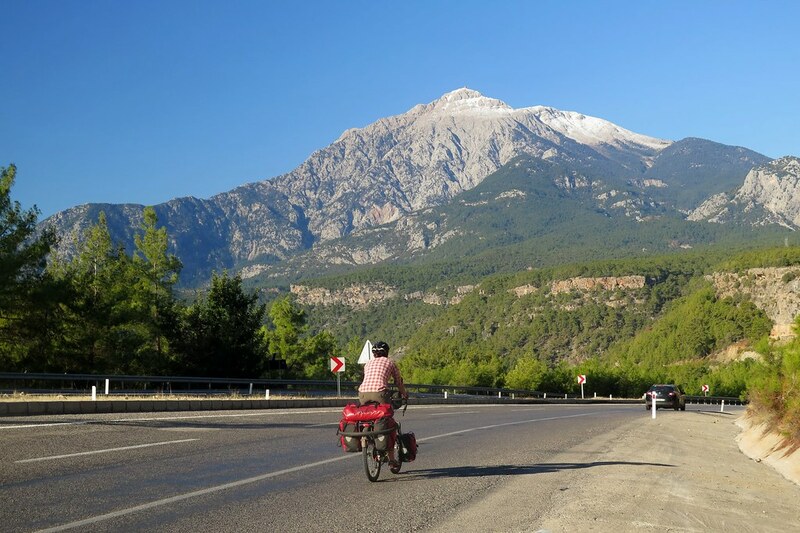 We were quite sheltered by the thick pine forest around us, but once we got back out to the road the sky was a deep blue and we had an amazing view of Mt Tahtali (2,366m, also known as Mt Olympos). 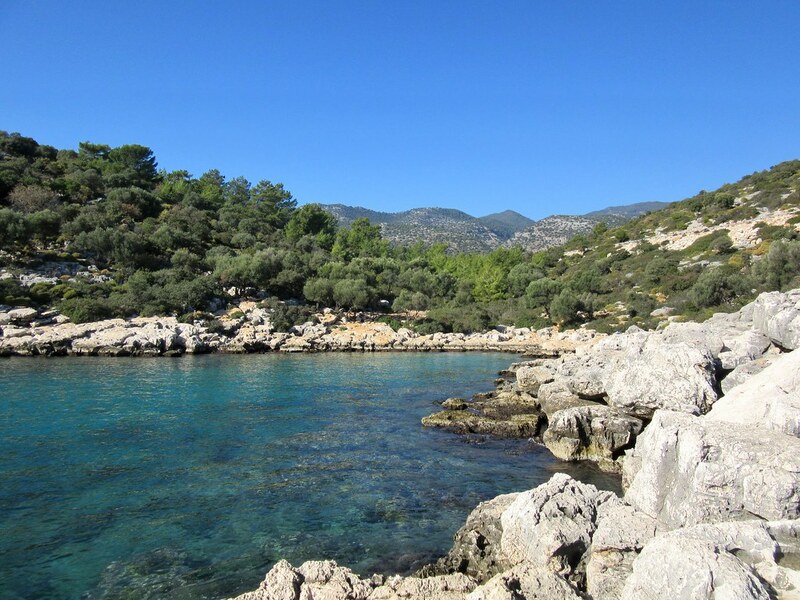 This area of the coast is part of the Olympos national park, made up of tall mountains, pine forests and stony beaches. We started climbing into those mountains through the morning. It was a pretty mellow, but sustained uphill, so we took it slowly and enjoyed looking down to our left at the sea and rolling hills. We stopped at a water tap for a tea break and just as we were getting up to leave, we saw two cyclists on loaded bikes speeding down the hill towards us. I whistled and the pulled over to say hi. They were Ivan and Zoia (www.life-miracle.org.ua) from the Ukraine. 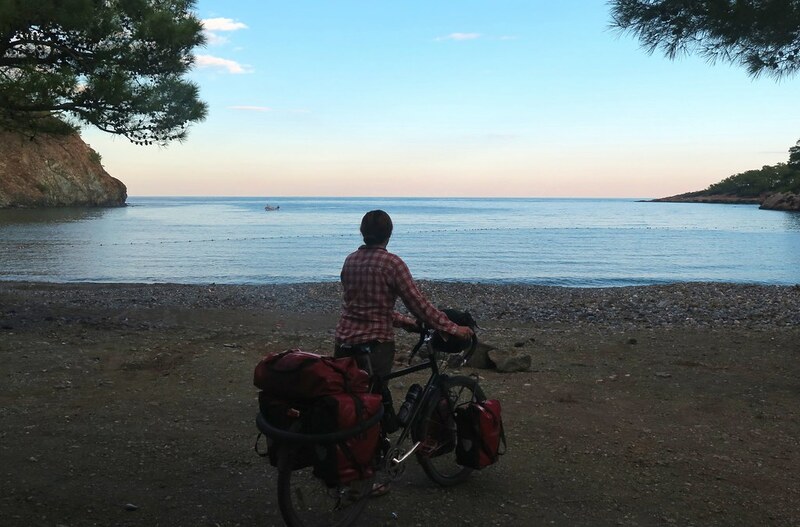 They set off from home 4 months ago and have cycled around the Black Sea to Turkey via the Balkans. They told us we were nearly at the top, so we continued on, stopping again for a quick Gozleme (cheesy flatbread) at a roadside cafe just as we were about to start downhill. We hit the coast again just past Kumluca where there was a long stretch of sandy beach. We’d covered the requisite 50km by this point, so it seemed like a good place to stop for the day. 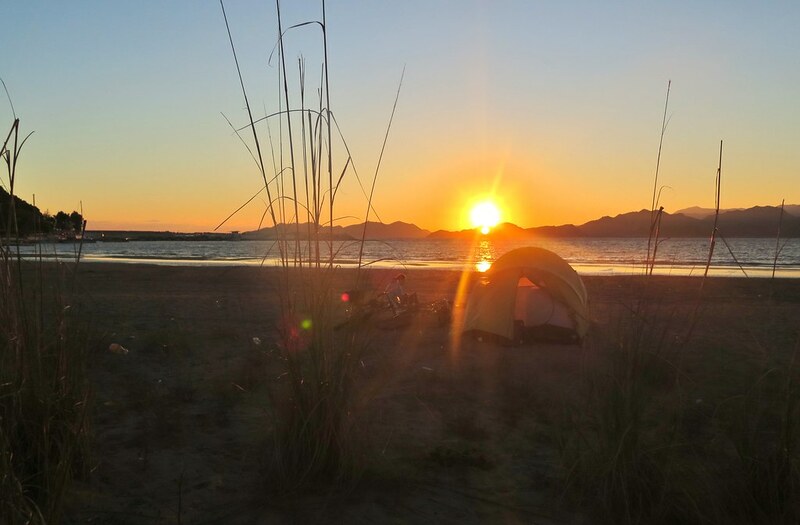 We pitched our tent on the sand, went for a paddle then watched the sunset. The next day was even more leisurely. We set off through Finike, then the road took us up onto some slightly higher ground south of the town. It was another sunny morning so we started looking for somewhere to stop for a tea break overlooking the sea. I spotted a gap in the barrier where we could sit on some rocks above a little bay. Once we’d pulled in we saw that there was a path leading all the way down to the water, so down we went. 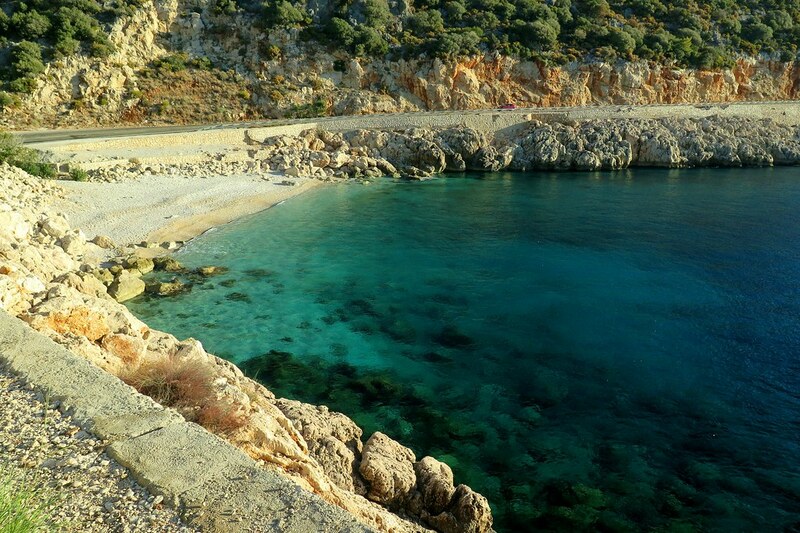 It felt really warm in the sun, sheltered from the breeze and the sea was incredibly clear. 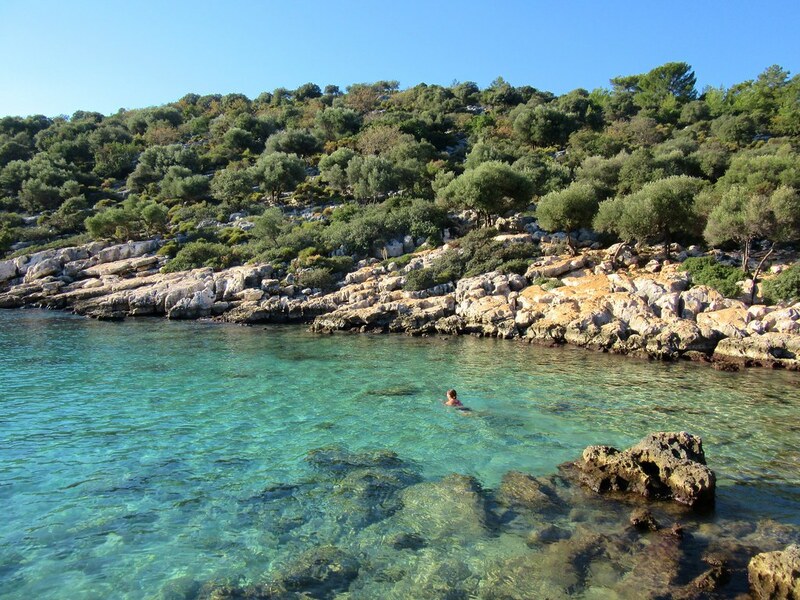 We spent a couple of hours there, swimming for a bit, then lying on the rocks in the sun to dry off. 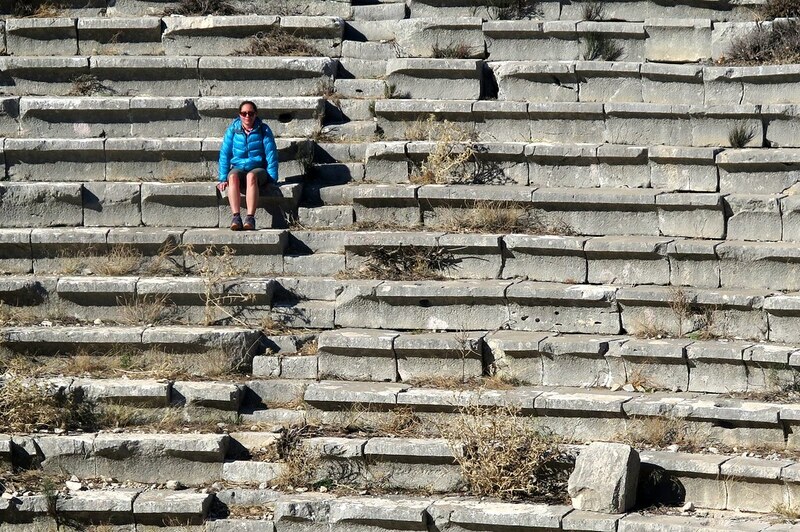 Eventually we decided we ought to at least cycle a bit more, so continued on towards Demre. The road stuck to the coast, winding in and out, with tiny beaches on the inside of every bend. It was absolutely stunning cycling. Just before Demre, the road took us around a lagoon, inland from the sea. We were definitely in holiday mode, as a sign for crab at a restaurant was too tempting to pass by. Barbecued crab and a plate of calamari washed down with a cold beer and we were happy cyclists. We finished the day on another beach, just past Demre. It was a bit of mission getting there, lifting our bikes up and over a footbridge and then pushing them through some sand dunes. 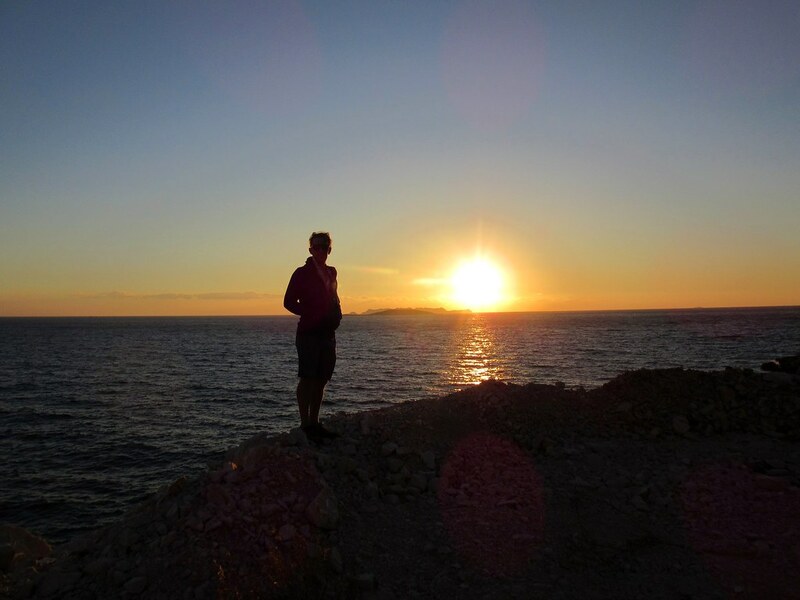 It was worth it though to have our own private beach and another sunset to round of a very easy but very satisfying day of cycle touring. We had to work a bit harder the next day. From the lagoon the previous afternoon, I’d seen a road high up on the mountainside to the south. I was worried for a moment that it was our road, but thought nah, why would it need to go up that high. But we were straight into a climb, and the road looped back on itself heading up towards the mountain I’d seen. It wasn’t the mellow gradient we’d been used to either, but a full on push in granny gear for a good couple of hours. The view back to the lagoon and over the coast was good, but it was a tough morning. Just as we got to the top, we met another touring cyclist, Thomas from France heading in the other direction. We gave him the good news that he had a about 18km of downhill ahead of him. He told us we still had another 25km of ups and downs before we got back to the sea. 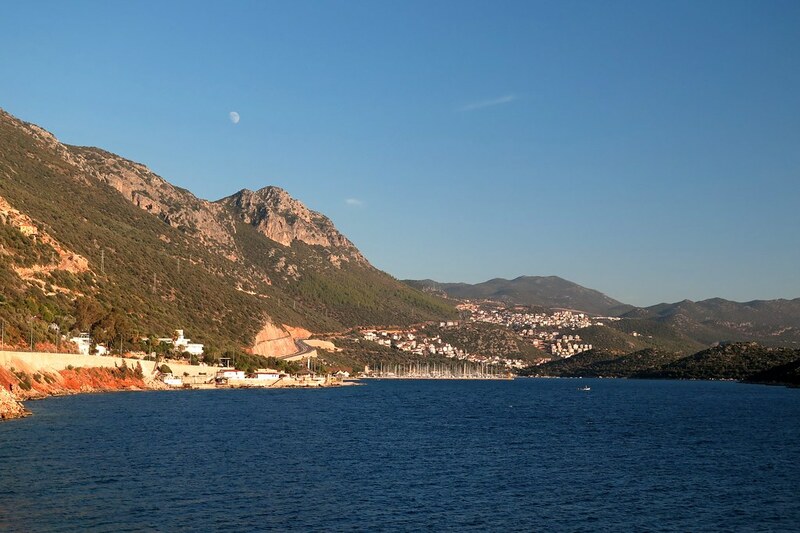 We pushed on, watching the distance to Kas, the next coast town, tick down slowly. On the last climb, we passed some pretty intricate houses carved into the cliffs and then reached a high point where we could see the sea and the road heading downhill infront of us. We stopped for a late lunch at a petrol station then put on some extra layers ready for a fast ride back down to sea level. 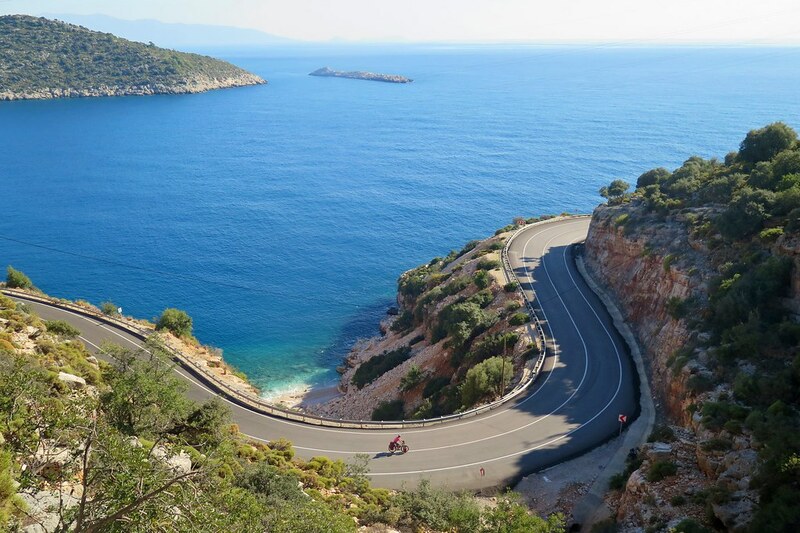 We lost about 650 metres altitude in a few kilometres on a really fun, twisty road taking us past Kas, perched on the hillside above an inlet. 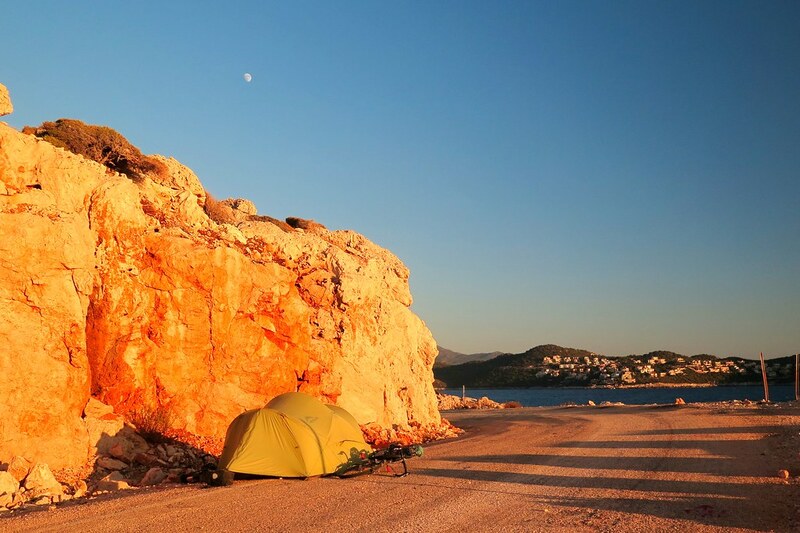 We were on the lookout for a camp spot from there on, the sun was getting low in the sky infront of us, and the moon was rising over Kas behind us. Close to the town, the couple of beaches we saw were fenced off and private, so we continued. We were back onto a rocky coast, with not much flat ground either side of the road. On a corner where a new part of the road took a direct route cut through the cliff, we went to investigate the old road, behind barriers and closed to traffic. We decided it was a good enough spot to put the tent, on the bend, seperated from the new road by several metres of rock. As we were unloading our bikes, we saw an old guy climbing up from the cliffs below. We gestured to him, asking where he’d come from, and he showed us a little route down through the rocks to a completely hidden beach where he’d been swimming. Once he’d gone, we went down to check it out and have a quick paddle. 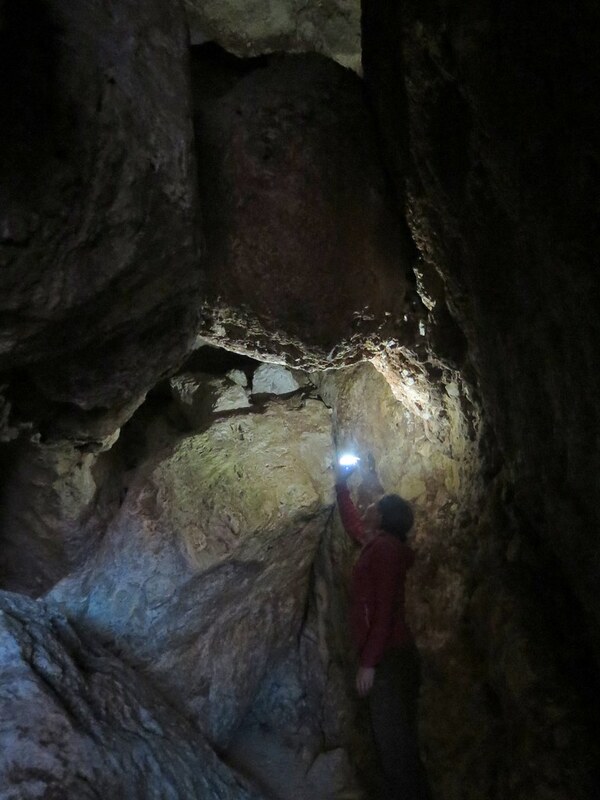 Behind the beach, we found a cave tucked in the rocks that stretched back under the road. A magical little place that we’d have completely missed if we hadn’t seen the guy coming back from his swim. From our camp spot at the cove, the road hugged the rocky coast the next day and we didn’t have far to go to our first pre planned stop. Our friends Ross and Risa had told us about Kaputas beach, a strip of white sand between the cliffs on this road (http://www.rvch.net/kaputas-to-chimera-heaven-and-hell/). It’s definitely no secret, it’s on the cover of the Lonely Planet, but we hadn’t realised it was along this road. In the summer it’s a busy spot, with deckchairs, sunshades and traffic jams, but we rounded the bend in the road and looked down over the edge to see it completely empty. Looking at the clear turqoise sea, we rushed to lock up the bikes and ran down the (many) steps and were straight in for another swim. It was amazing floating in the water looking up at the steep cliffs above us and the seemingly private beach we had all to ourselves. It was so crystal clear, I wish I’d had some goggles, but even with the naked eye swimming underwater the visibility was incredible. We lazed on the beach in the sun. A few people pulled in off the road to have a look at the beach and take pictures from above, but no one came down the steps. I’m sure they wondered who the two crazy people were swimming and sunbathing in mid December. Must be Brits. 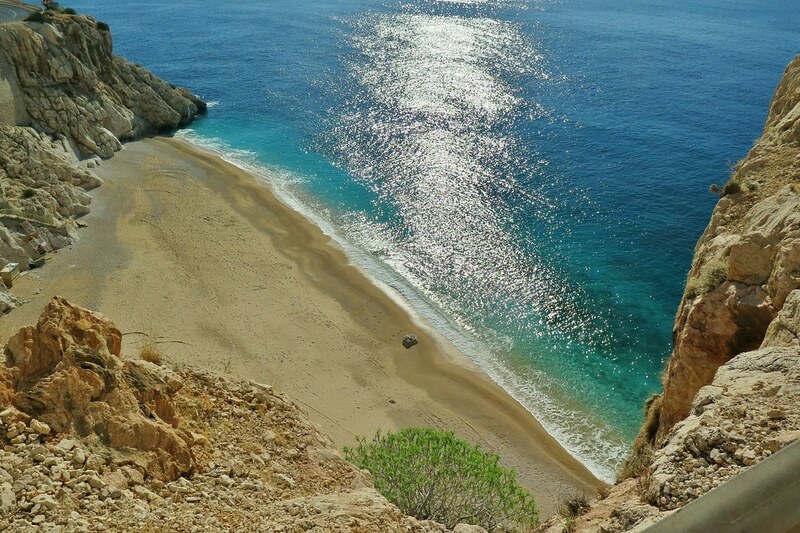 At the back of the beach, the two cliff faces meet and theres a narrow gorge that goes back into the hillside. 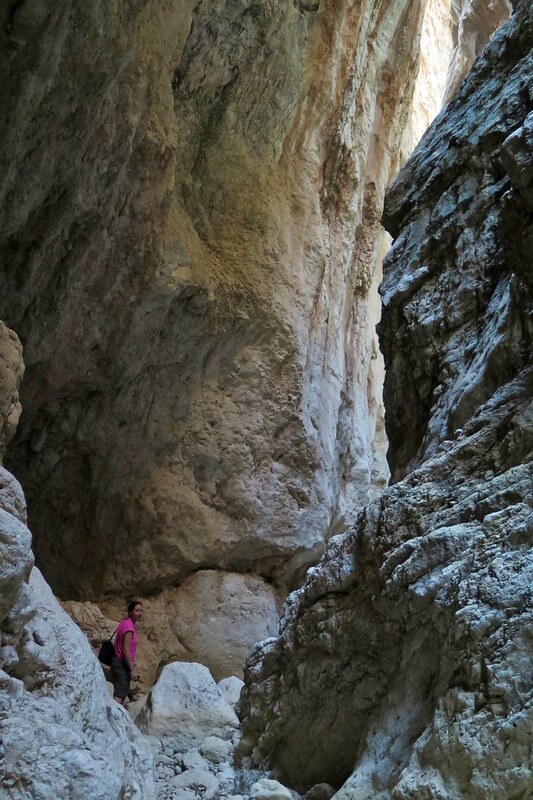 We walked up there, scrambling over and ducking under rocks as far as we could. We got to a point where we couldn’t go any further, where I imagine at some times of the year there’s a waterfall, but it was dry now, and perfectly silent. A fun little adventure before we trekked back up the steps to our bikes to continue west. 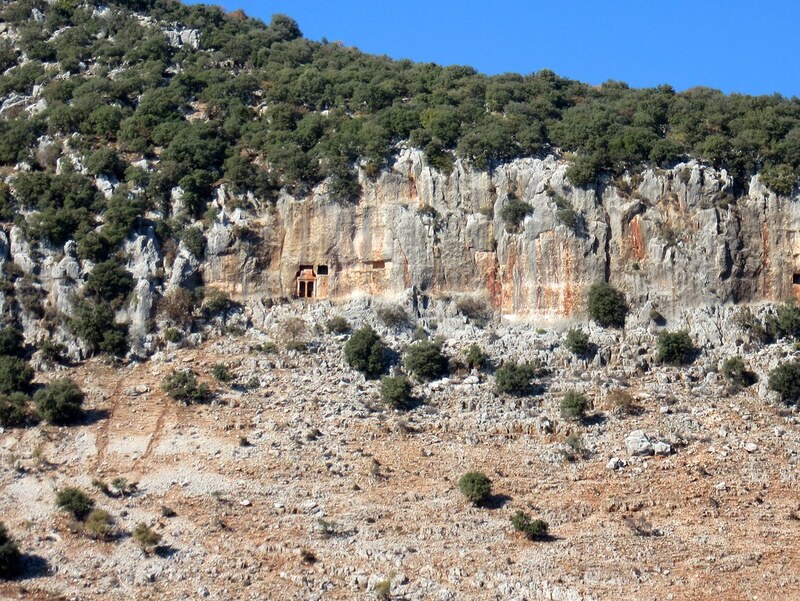 We had an abrupt climb away from Kaputas, over a ridgeline towards Kalkan. Coasting down the far side, we pulled off into the town, which spreads down a steep slope to a harbour in an inlet. We stopped for lunch and to pick up some supplies at a supermarket, which was very well stocked with familiar brands and English food. This area has a lot of British expats, and Brit owned second homes it turns out. 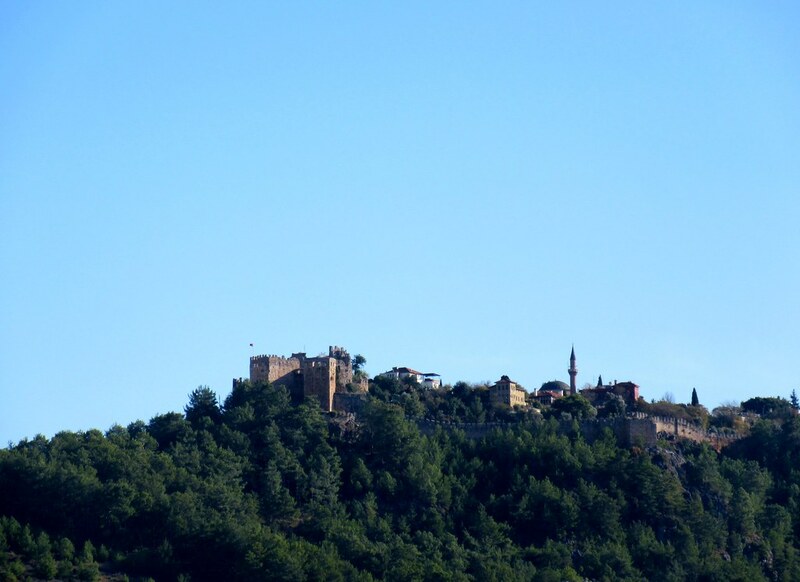 Our next stop, nearby Fethiye has the largest number of British residents in Turkey. We might be able to get a full English breakfast somewhere! Kalkan’s location on the side of a hill means the main street is super steep so we had a ridiculously steep climb to get us back on to the main road. Just what we needed after a big lunch. It didn’t last us too long though and we were back onto a more reasonable gradient heading inland into the next valley where the road took us down towards Golbent. We stopped at a mosque there for water then looked for somewhere to camp. 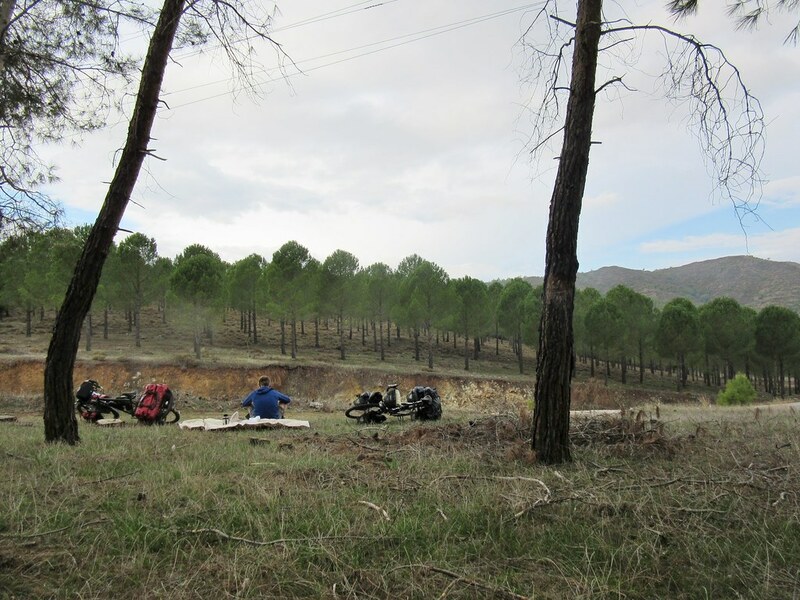 Of course, before we had water, we had been riding through empty forests perfect for pitching the tent. Now we were ready to stop, we were surrounded by houses or farmland. 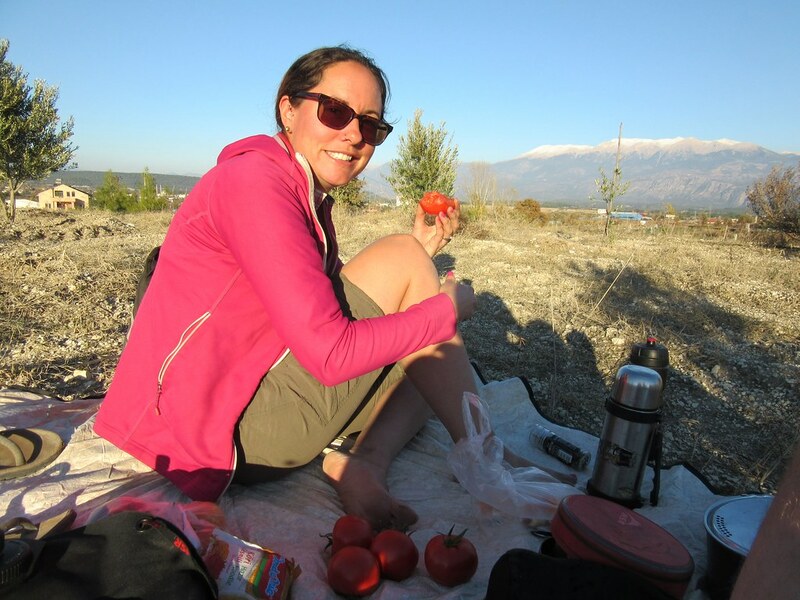 We saw a farmer loading up a tractor with tomatos next to the road and asked if we could camp on an empty area of land above. Once he understood my poor attempt at using Turkish, he replied in pretty good English saying it would be no problem. He even gave us a few of his tomatoes. We slept well but felt a little colder in the morning. It was darker and we weren’t seeing the usual orange glow that usually started warming the tent in the morning. For the first time since leaving Alanya, it was cloudy. 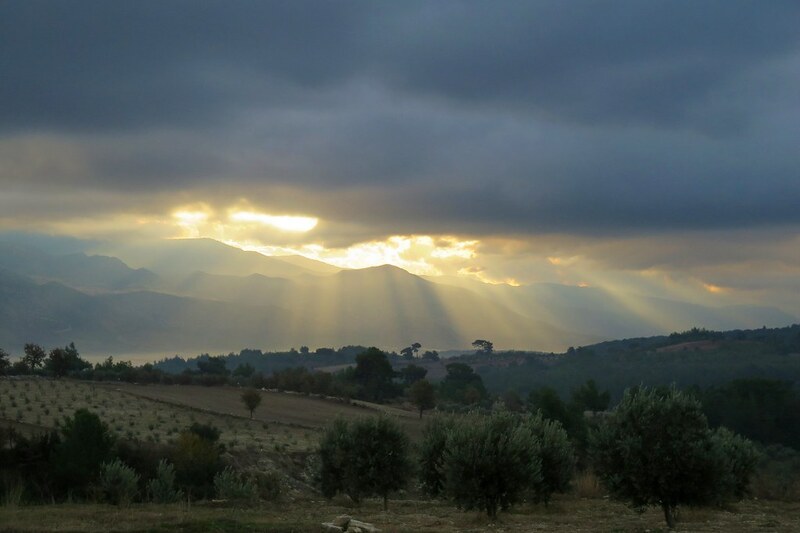 The sun did start breaking through as we were packing up to leave, but once we hit the road it got greyer and looked like rain might be coming. 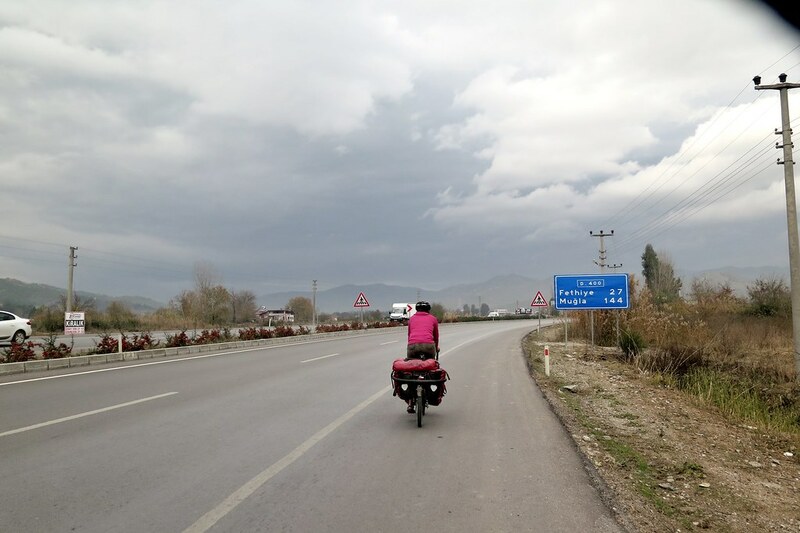 We had 50km to cover to get to Fethiye through some rolling hills. It was a colder ride, we had to wear full gloves and a couple of layers to stay warm on the downhills. We stopped for a tea break in a forest, then the clouds really started looking ominous. 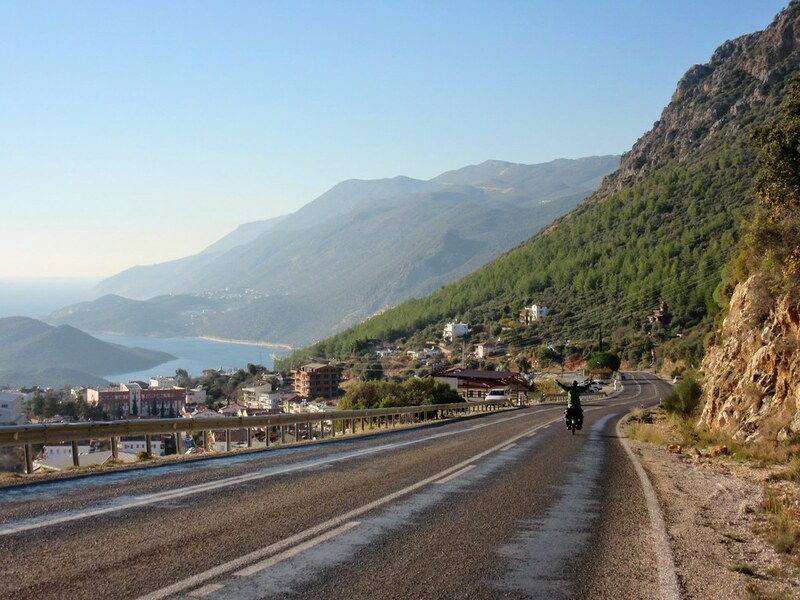 We rejoined the other road from Antalya (the inland, mountain route) and had one last short up and then a long downhill getting us back to sea level. We were pushing hard and riding fast as a few drops of rain were falling on us at this point. 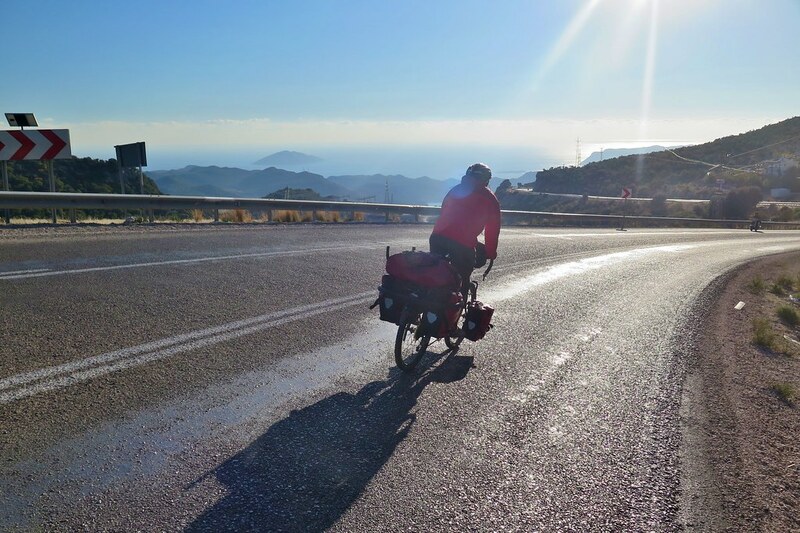 When we had seen the weather was looking a bit dodgy, we’d got on wifi to book another bargain apartment in Fethiye, so the race was on to get there before the rain hit hard. Oh I am so very jealous of your trip! 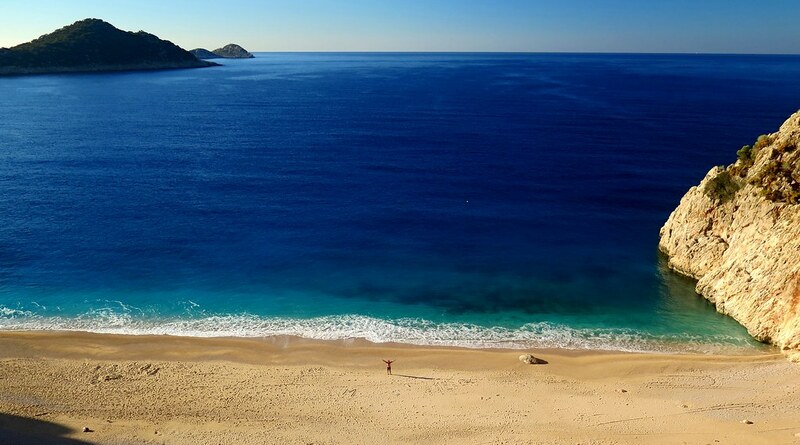 This is beautiful, I personally went to turkey 2 years ago and it was beaitufil, wish I had done more research on Alanya after seeing this! Loving it! Wish I could come out and join you guys for some of this. I just had surgery on my shoulder (from a bike crash here in London), so I’m not allowed to ride a bike (nor snowboard) for a while… Looking likely that we’ll be moving to San Francisco in the next few months, too. But… thanks for the offer! If things work with timing, I might just take you up on that!! 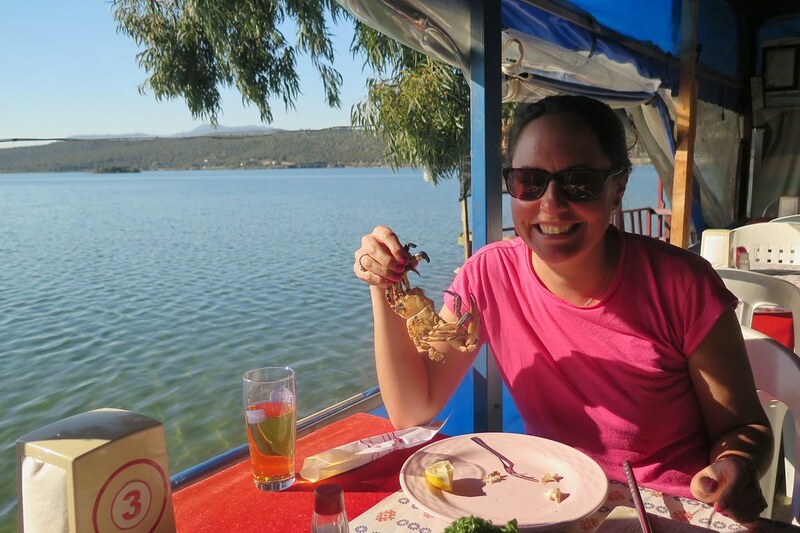 Sunbathing, swimming, crabs and beer for lunch – it’s almost like you’re on holiday. 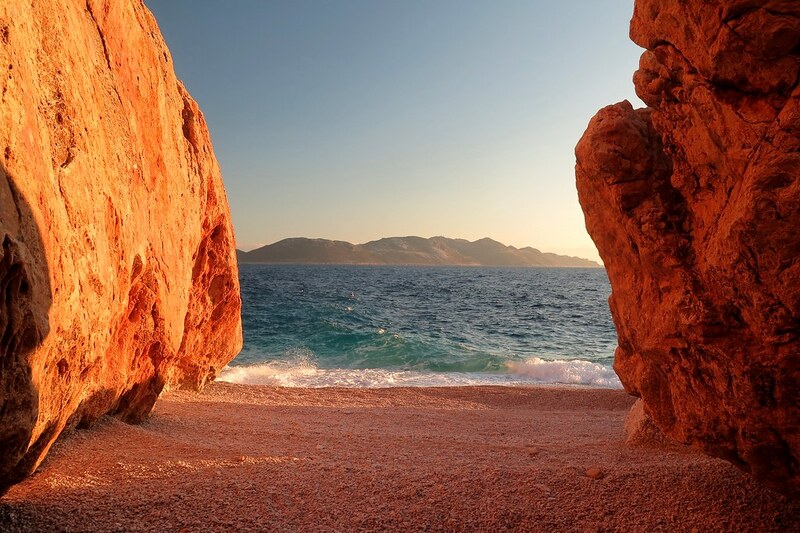 Lovely part of Turkey you’re in – enjoy! Yep! Very definitely in holiday mode around here! Wouldn’t want to work too hard. It is indeed a beautiful area, I’d recommend it for cycling, if you’re thinking of destinations for your next trip! You are certInly seeing some wonderful countryside and great experiences.